An archive of Russell Hoban's manuscripts as well as the Apple computer on which he wrote several of them has been acquired by the Beinecke Rare Book & Manuscript Library of Yale University, USA. The news comes more than two years after the manuscripts were catalogued by Paul MM Cooper, the British novelist who wrote an exclusive feature for this site in 2014 about the task. For a time the archives were being openly offered to institutions, but nothing more was heard by this site until a fascinating blog post was published the week before last on the discovery of Hoban's computer at the library by Matthew G. Kirschenbaum, an English professor at the University of Maryland who also writes about the history of word processing. Upon contacting the Beinecke Library for confirmation, Tim Young, Curator of Modern Books and Manuscripts said: "The Russell Hoban Papers have been acquired by Beinecke Rare Book and Manuscript Library of Yale University in New Haven, Connecticut. "The papers consist of notes for and drafts of manuscripts for children’s books, novels, and stage works, along with correspondence with agents and publishers and selected personal papers. "The archive joins the papers of Russell Hoban’s first wife and collaborator, Lillian Hoban, which came to Beinecke Library in 2013, and the papers of many other notable writers, including Thomas Disch and Kit Reed. "Work is ongoing to create a preliminary listing of the contents of the Russell Hoban Papers, prior to full processing. Open access will be available to the papers when the preliminary listing is completed in early 2017." 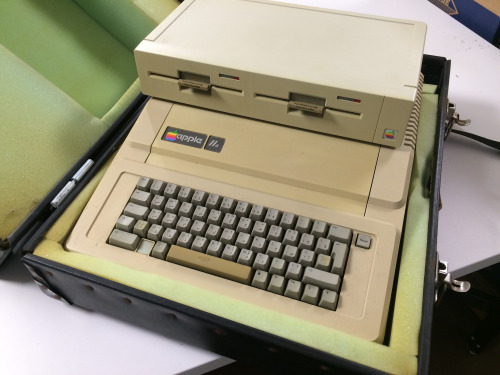 In the aforementioned blog post, Kirschenbaum describes how a chance visit to the Library led him to the Apple IIe computer, which turned out to be part of the archive acquisition. NNSVSNU TSRUNGH, said the green letters on the monitor screen of my Apple II computer that rainy night in November. This screen isn't like a piece of paper; the words come out of a green dancing and the excitation of phosphors. I'm the one who makes the words appear but I don't always know who or what is speaking. 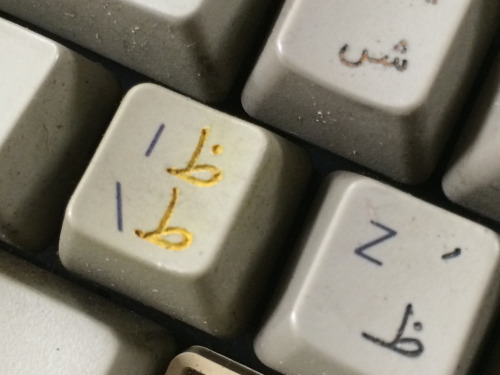 Kirschenbaum also ponders on the origins of Arabic characters engraved on the Apple's keyboard. "This is a striking example of just how individuated and affective a writer’s computer can be," writes Kirschenbaum, "and why we should preserve material hardware along with software and data." We asked Jake Hoban, Russell's son, about the keyboard, who commented: "Although Russell got into Islamic matters when writing Pilgermann I don't think he ever tried to learn the script. Maybe he got it like that on his travels." The published manuscript of Pilgermann does not feature any Arabic text, although whether the Beinecke Papers include rough drafts of the novel which do is an exciting prospect. The fact that Hoban likely didn't read or write Arabic may not come as a surprise to readers who will be aware that he liked to conjure an atmosphere to aid the writing process. He would often select specific music to help him along, gather found objects from travels, consult maps, take photographs and listen to distant radio station broadcasts in languages he didn't speak. It's not clear when Hoban acquired the Apple IIe, but the computer was launched in 1983, the same year of Pilgermann's publication, while The Medusa Frequency was published in 1987. The Beinecke Library is situated in West Haven, Connecticut, about 180 miles north-east of where Hoban grew up in Lansdale, Pennsylvania and about 35 miles from where he lived for many years with his first wife, the illustrator Lillian Hoban, and their children in Wilton, Connecticut. Hoban lived and worked in London for the last forty years of his life and it was there that he produced works including Riddley Walker, Pilgermann and The Medusa Frequency. Martin Eve, Professor of Literature, Technology and Publishing at Birkbeck, University of London and a longtime supporter of this website, commented: "I think it's fantastic that Yale has recognised the importance of the Hoban archive and that the materials that surrounded Russell during his working days - the 'exobrain'* of his office, as he called it - will now be available to scholars and interested members of the public. "Of course, Russell was always sceptical of academics/critics and our potentially pretentious readings of his works but it is also fitting that, at last, the significance of his writing has been acknowledged by one of the most esteemed academic institutions in the world."